So, in the comment section of Sacred Circles, my friend Jan asked, “What is a staddle stone?” Good question! 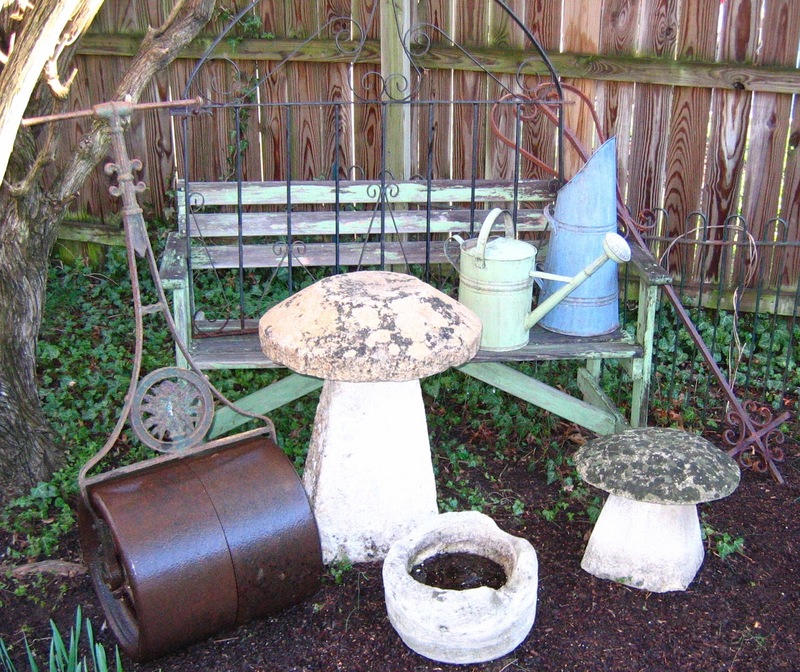 On my first antique buying trip to England, a friend asked me to find her one of those “stone mushrooms.” Having never been to the Cotswolds, I had no idea what she talking about. But once we had arrived in the lush green rolling countryside, it didn’t take long to spot one. Or two. Or three. Despite having a very large container to fill with inventory and only a few days to do, I did not buy a staddle stone that trip. We experienced a bit of sticker shock. 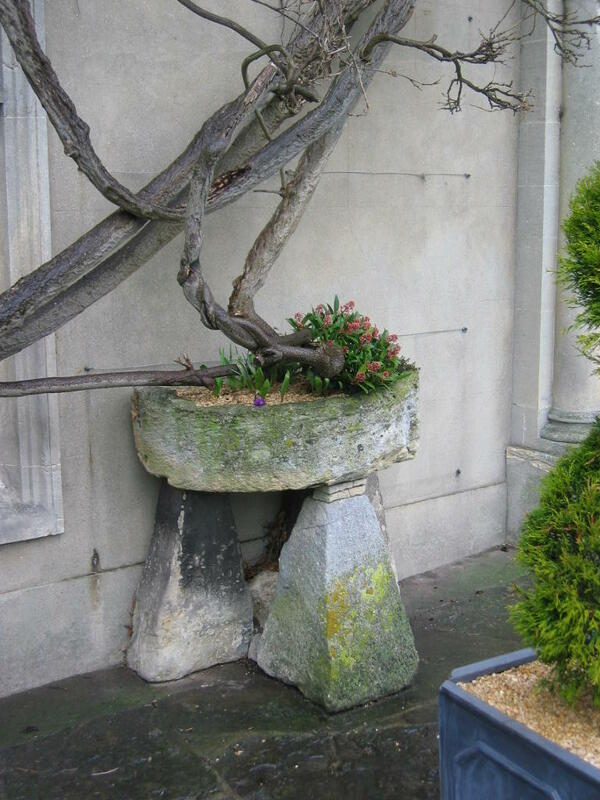 A nice staddle stone selling in the US at that time would run between $800 and $1200 retail. 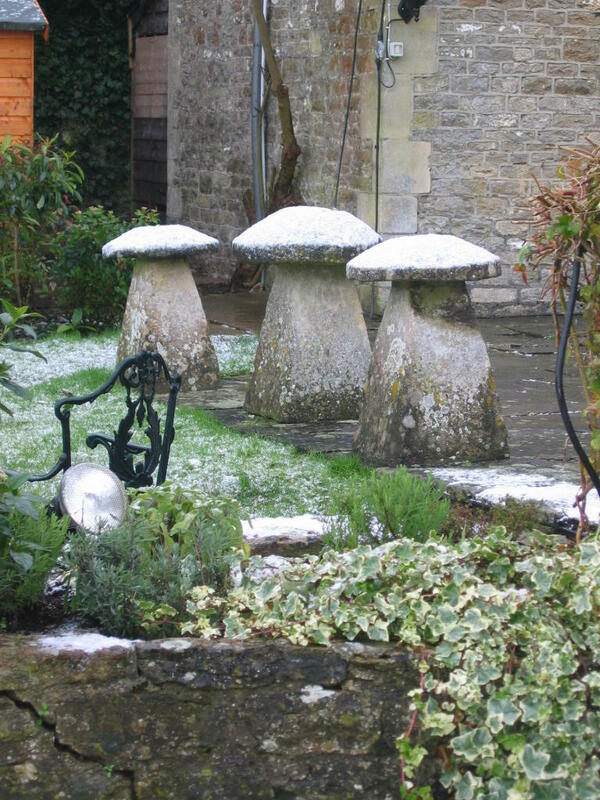 Staddle stones do look like mushrooms. Proper ones are made of stone (although there is a growing market for newish concrete varieties.) Many are around a century old. The loveliest examples usually are mossy. Staddle stones were originally used as a base for granaries. The height of the stones kept the grain from getting damp and their shape was difficult for rodents to navigate. 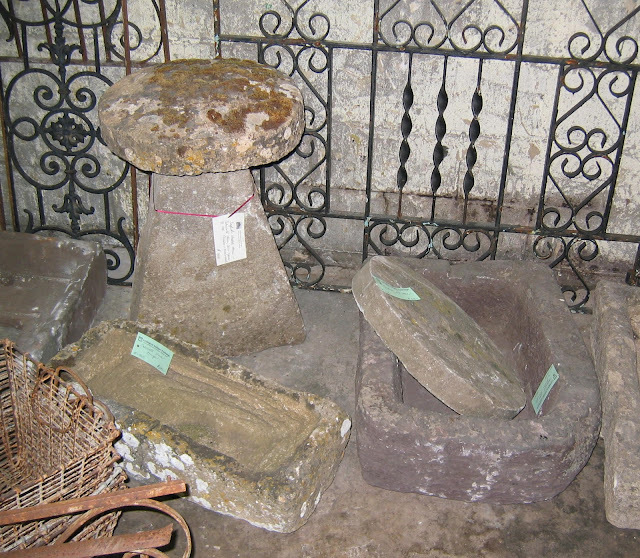 The staddle stones ensured the stored grain was kept dry and critter free. Now they are prized as garden ornaments both in the UK and the US. I have three staddle stones in my garden. I have a large “proper one” made of Cotswold limestone. I have a small concrete one and I have a miniature one. They are all very different and, like my children, I cannot choose a favorite. I sourced quite a few of them in the Cotswolds for my mother, friends and clients. They are not difficult to find. They ARE difficult to find at an affordable price. I once sold a very unusual matched pair of staddle stones to a woman who lived in the heart of Washington, D.C. She traveled all the way to Benton, Ky to visit my shop. That was the only matched pair of staddle stones I ever saw. I could tell that the dealer I bought them from instantly regretted selling them. This short and squatty staddle stone is perfectly at home in the serene shade garden of my client and friend. I love it when I can visit the things I sold!